When will Monsoon start over Pakistan? – In Detail! Monsoon season is the annual rainy season in Pakistan. The country depends heavily on these monsoon for its agricultural and water needs. The south-west monsoons roars onto the subcontinent during the summer. The winds carry moisture from the Indian Ocean and bring heavy rains from June to September. The torrential rainstorms often cause violent landslides. Entire villages swept away during monsoon rains. Despite the potential for destruction, the summer monsoons are welcomed in Pakistan. Farmers depend on the rains to irrigate their land. Additionally, a great deal of Pakistan’s electricity is generated by water power provided by the monsoon rains. When will monsoon reach Pakistan in 2011? Pakistan is lashed by the rains from July to September from the South-west monsoon. This monsoon reaches Pakistan towards the beginning of July and establishes itself by the middle of the month. 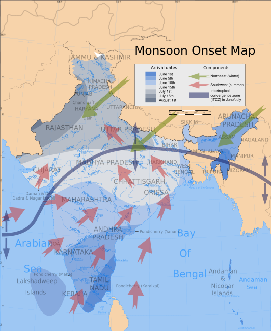 The strength of the monsoon current increases from June to July; it then remains steady, and starts retreating towards the end of August, though occasionally, it continues to be active even in September when some of the highest floods of the Indus Basin have been recorded. After September the monsoon withdraws from the country. But tropical activity could occur before and after the monsoon, mainly in May till June and then in September till October. Certain events like El-Nino, La-Nina, +IOD or -IOD have major effect on the timing and intensity of the monsoon. During the month of August only one monsoon system developed in the Bay of Bengal on August 27, this weather system initially moved rapidly in a northwesterly direction and reached over southeast Madhya Pradesh (India) on July 28. 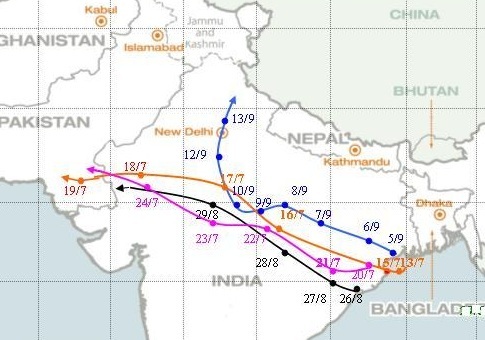 After moving west northwestward it reached Rajasthan on July 29 and weakened gradually. Under its influence moderate to heavy rainfalls were recorded over southeast Sindh. In Karachi, this well-marked low pressure caused 147 mm rainfall on August 31. In 2010, Pakistan saw its worst flooding in its living memory. Wet conditions prevailed in Sindh till September and then again in November. Karachi got 741.9 mm during this monsoon, while the average is just 146.4 mm. On June 2, a strong tropical storm “Phet” in the Arabian sea intensified into a category-4 hurricane. Cyclone caused heavy rainfall with fast to strong winds over Sindh province on June 6 and June 7. Karachi got 152 mm rainfall during this period. On June 14, some pre-monsoon currents from the Arabian sea caused light rainfall with strong winds in Punjab. On July 5, a monsoon low pressure approached Sindh through the Indian state of Gujarat and caused moderate rainfall till July 7. During this period a total of 57.5 mm rainfall was recorded in Karachi. On July 23, an upper air cyclonic circulations caused heavy rainfall of 53mm in Karachi. Another low pressure from July 26 till July 28 caused heavy rainfall of 139 mm in Karachi. This monsoon system caused extreme rainfall in Punjab and Khyber that started the floods of 2010, the low pressure interacted with a string western disturbance over Gilgit. 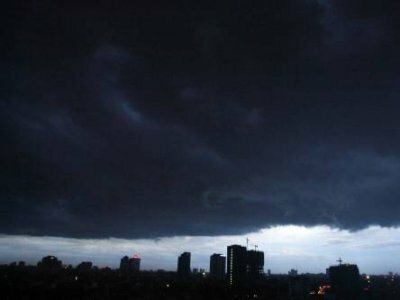 From August 7 till August 9, at least 180 mm rainfall was recorded in Karachi with intense thunderstorms. This system enhanced the intensity of the floods. Moisture from Arabian sea caused 3.5 mm rainfall on August 15 in Karachi. August remained rainy in Punjab and Sindh, with some what daily drizzle in Karachi. On September 1, 5 mm rainfall occurred in Karachi with fast winds as a low pressure was dissipating over Sindh that came from India. From September 9 till September 11, a very heavy rainfall with strong winds lashed Karachi and Sindh province, at least 150.6 mm rainfall was recorded during that period. Western disturbance affected Punjab after this system dissipated. 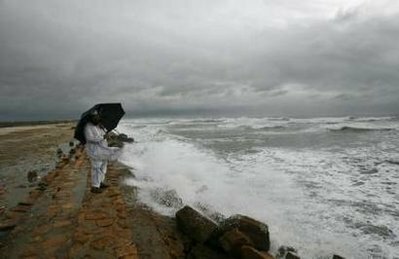 On November 9, the remnants of Cyclone Jal that formed in the Bay of Bengal, reached Sindh-Gujarat coast after a long journey, the storm slightly intensified and caused light drizzle with dusty winds in Karachi and south-eastern Sindh. On November 23, a low pressure are formed near Sindh and Gujarat that caused drizzle in Karachi and adjoining areas of the city. The IMD has predicted that the monsoon will hit Kerala on May 31 (normal date), though there forecast changes in June but as of now they are firm on their earlier decision that is the monsoon will enter India on May 31. Pre monsoon activity in India is likely to start between May 17 and May 20, under that influence heavy rainfall are forecasted in Kerala and other adjoining areas. These rains will be isolated but after May 31 they might become scattered. These factors should happen because if they fail to reach India on time, the monsoon will then definitely reach Pakistan late. 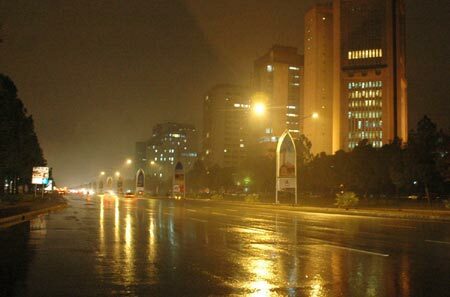 When will Monsoon start over Karachi? 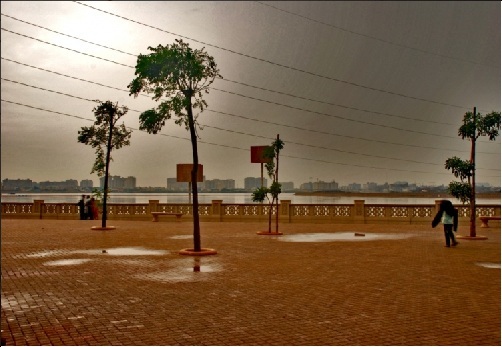 In 2007, Proper monsoon rains started from July 1, 6-days earlier. Heavy Pre-monsoon activity was observed all over June in Karachi. 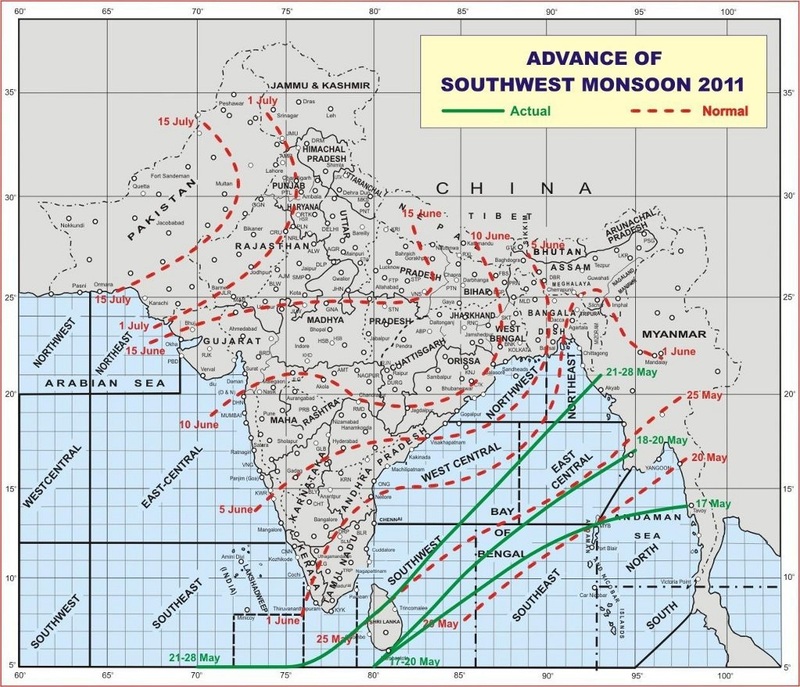 In 2008, proper monsoon rains started from 29 July, 22-days delay. No pre-monsoon activity was observed in Karachi. 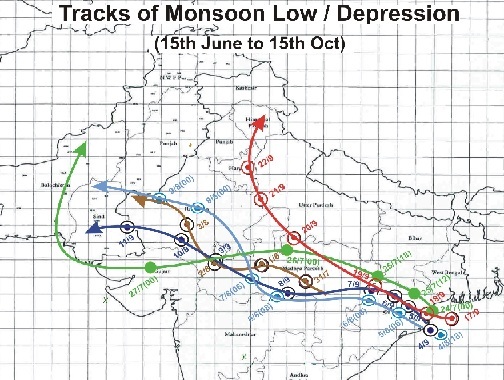 In 2009, Proper monsoon rains started from July 18, a 10-days delay. Pre-monsoon activity was observed in June in Karachi. In 2010, Proper monsoon rains reached Karachi on July 5, 2-days earlier. Pre-Monsoon activity was observed in late May and early June. Cyclones usually strike between May and June before the onset of the monsoon, or between October and November, just after it ends. Once the monsoon clouds set in that July and August, they prevent cyclones from developing beyond the initial stage of a deep depression (tropical depression). Monsoon could reach Karachi between mid-July. But there is no chance of pre-monsoon activity in Karachi as of yet! So keep your umbrella, emergency, help line, generators ready Karachiites to avoid any uncertain incident, as monsoon is just around the corner. ← Super cyclones – The future of the Arabian sea!! From the end of may there is rainy forecast and precipitation over and near punjab,nwfp,kashmir and all bay of bengal located areas and northern india.Is this monsoon rains forecast? Punjab, Khyber, Kashmir could get light rains from May 20 due to a western disturbance…Pre-monsoon activity in Bay of Bengal… While an upper air cyclonic circulations have formed over South east Arabian sea (not a cyclone) that is causing pre-monsoon showers over India..it will bring pre-monsoon winds to lower Sindh and south eastern Sindh including Karachi during this week and coming week.. This 24 hours load shedding by KESC in karachi has made our life worse. Punjab,khyber and kashmir either gets rains by Western disturbance or bay of bengal or from other sources almost every week but our city karachi only waits for rains whole year. Karachi should get rains daily from June like Mumbai and Dhaka and Rangoon so that we can get rid of this hot weather and load shedding AZAAB. Actually and In reality, Every city and province of pakistan has winter and summer rainy seasons except karachi and sindh. Thats why we also want winter and summer rains in karachi like other locations.When whole year during winter and monsoon khyber, kashmir, punjab and balochistan gets heavy rains then, Nobody never says that heavy rains can damage badly and its enough. will typhoon form in june in KHI? Salaams! Would just like to inquire – has World Weather Post ripped this article off you, or have you ripped it off them?